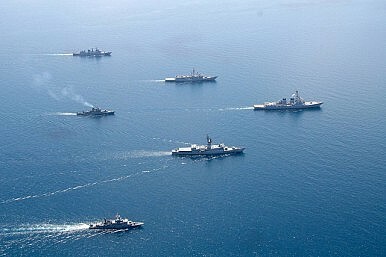 US and Thai ships transit the Gulf of Thailand during Cooperation Afloat and Readiness Training (CARAT) Thailand 2011. A Japanese scholar sees more continuity than change in Bangkok’s foreign policy. Thailand is not shifting its foreign policy dramatically towards embracing China at the expense of the United States, a leading Japanese scholar said Wednesday. Growing estrangement between the United States and Thailand following a bloodless coup in May 2014, coupled with Bangkok’s decisions to initially award a submarine deal to China and hand over 109 Uighurs to Beijing, have led to concerns that the country’s generals are moving too close to China (See: “Is China’s Submarine Deal With Thailand Now in Peril?”). But Nobuhiro Aizawa, an associate professor at Kyushu University and a former researcher at the Japan External Trade Organization (JETRO), told an audience at a Washington, D.C.-based think tank that he did not see any serious shift towards China in post-coup Thai foreign policy. “In terms of foreign policy, I would rather see more similarities,” Aizawa said at an event at the Carnegie Endowment for International Peace. If, for instance, one were to compare the travel schedules of ousted former prime minister Yingluck Shinawatra and Thailand’s current leader Prayuth Chan-o-cha, Aizawa argued, there would be a consistent pattern of visiting Thailand’s neighbors as well as China and Japan. “The mix is totally the same,” Aizawa said. This continuity, Aizawa argued, was not surprising. Despite some shifting priorities, Thailand’s main foreign policy objective is to continue to preserve its status as the main geographical hub of continental Southeast Asia. The foundation for this has been built over decades by both Bangkok’s centrality to U.S. military strategy as well as Japanese investment in Thailand – factors that will continue to be important moving forward in spite of China’s role. “That geographical setting is the core interest of Thailand that they want to maintain, whoever the leadership is,” he said. Economically, while China continues to play an important role in Thailand’s development, Aizawa emphasized that Bangkok also continues to court other players as well – including South Korea and India. This is not only because it allows the country to maintain “different portfolios,” but because there is some tension between China’s ambitions to make Kunming the hub of continental Southeast Asia through an ambitious string of infrastructure projects in the region and Bangkok’s own aspirations for that status. “The stake is who gets to get the hub status in the economic integration period,” he said. On the security side, Aizawa did acknowledge that there has been somewhat of a greater focus on China. But he argued that this was a consequence not of any deliberate shift by Thailand to align itself closer with Beijing, but a product of the growing distance Washington has created with Bangkok. He also said that some Thai officials see the country as being too reliant on the United States on the defense side – something fixed due to the alliance – such that any opportunistic courting of Beijing would help restore at least some balance in this domain rather than change the country’s orientation in a meaningful way. “They say we do emphasize China, but it is not that we shift away from the US. We cannot alter [that],” he said. More China Battle Tanks for Thailand?Thailand’s ASEAN Chair Challenge in 2019What Will the 2018 Cobra Gold Military Exercises in Thailand Look Like?What’s Behind the New US-Thailand Military Facility Hype?What’s With the New China-Thailand Military Facility?